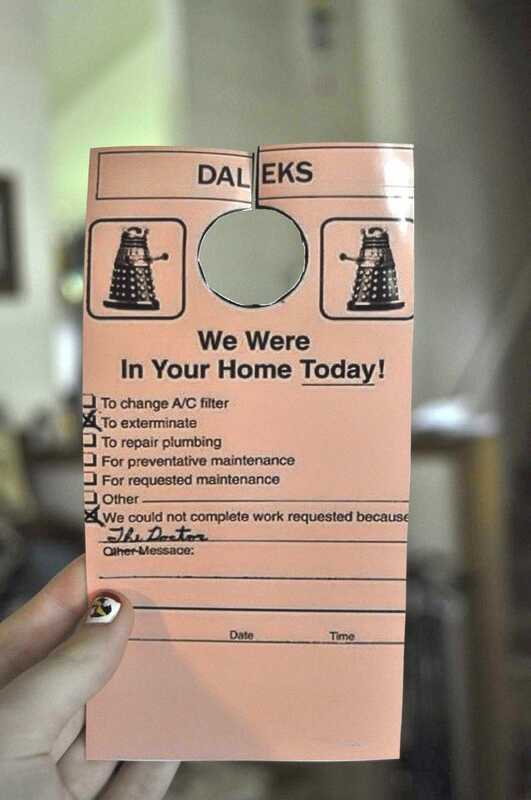 They may want to exterminate you, but at least Daleks are decent enough to let you know they've come round and missed you. Redditor narfy claims the monstrous cyborgs left this calling card on the doorknob of her friend's house yesterday morning. Almost makes you wish some Daleks would pay you a visit, doesn't it? Note: Redditor FajitaofTreason points out that the door hanger is from the awesome wallpaper featured below (click to enlarge). And for those of you wondering: yes, Bailey Apartments exists, and that is their actual phone number. Unfortunately, when we called to inquire about the sign, they had absolutely no idea what a Dalek was, let alone Doctor Who. Worry not — we took it upon ourselves to enlighten them.